Despite Chunk nearly being 3 years old, we still have our ups and downs with sleep. I don't remember what I looked like without dark circles and bags under my eyes and I'm scared these are now a permanent feature of my face! There's lots of books and techniques on the market these days, but I have found few to work and I'm always on the look out for ideas that might help! So when I was given the chance to review The Happy Sleeper I naturally agreed. 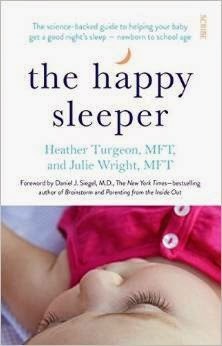 The Happy Sleeper is written by sleep experts Julie Wright and Heather Turgeon and it offers an alternative sleep training technique to others such as attachment parenting or controlled crying. They believe in the importance of making your child feel secure, happy and safe within their bedtime routines, and they give advice on how to create good sleeping habits and get rid of the rubbish ones that we can sometimes end up having! The book covers baby sleep, toddler, child and even parent sleep which impressed me, because it is a book that can be used time and time again throughout your parenting and is relevant for the entire family. One of my favourite things about it is how there are so many questions answered about so many sleep-related issues, from colic, sleep regression to moving from a cot to a bed. And most importantly it is not full of jargon, which is essential for me as I do most of my reading late at night in bed when my concentration is at its worst! I'm giving away one copy of this book so to be in with a chance of winning, complete the Rafflecopter form below- good luck! I find the hardest thing is stopping myself checking on her every 5 mins they look so peaceful when they are sleeping. I would love the chance to win for a friend who is not getting much sleep at the minute. That my kiddies never sleep at the same time and wake each other up!